My husband and I love zucchini pizzas because the toppings seem to be more flavorful when on the zucchini than when on bread. They are much lower in calories using zucchini instead of dough. If you have not tried using zucchini to make pizza, I highly recommend it! 1. Slice zucchini in long 1/2 inch thick slices and place on a pan covered in nonstick spray. 3. Spread pesto over slices of zucchini. 4. Sprinkle cheese over sauce and then top with pepperoni and onions. 5. Bake for 10-15 minutes in oven until cheese is melted and zucchini is soft. These will need to be eaten with a fork because they can be a bit messy. These are a family favorite and will be made again soon. If you like this recipe, please feel free to pin it! This is fabulous! I just found out I have celiac disease and cannot have gluten- so my days of pizza with regular crust are GONE. 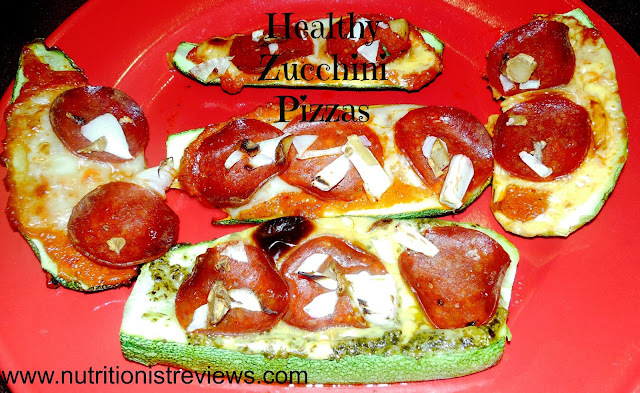 However, this idea of pizza ON zucchini is great- esp. for people who have to be gluten-free or have gluten sensitivity. I am trying this asap and will post what I think. Sounds delicious, though, I have to say. Thanks so much Georgette! They are honestly so good. You can use regular sauce too if you prefer. Let me know what you think!